Shallow occlusal anatomy means less tooth reduction. Thick occlusal surface to prevent bite-through. Parallel walls allow for operator fit control. Pre-trimmed to optimum length and contour to save placement time. 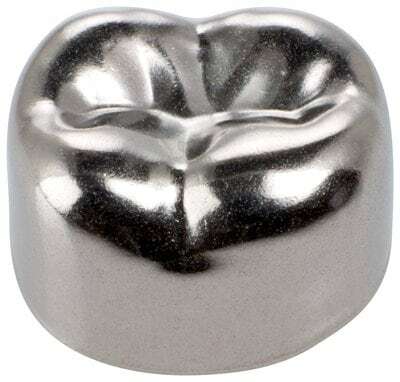 Available in molar styles to meet your adult patient needs. Crown set is packaged in a unique, stackable tray that provides convenient, easy storage of 3M™ ESPE™ prefabricated crowns. Wide array of shapes and sizes. Prefabricated stainless steel crowns with proven successful clinical use for short- or long-term adult posterior use. 3M™ Unitek™ Stainless Steel Permanent Crowns is rated 4.0 out of 5 by 1. Rated 4 out of 5 by agreiss from Easy to use! Quick and easy. Takes me so little time to restore heavily broken down primary teeth.